NORTH ELMHURST – Reaching into his apron pocket to retrieve a pile of neatly-folded, biodegradable brown napkins with the names and phone numbers of women he has served at the new North Elmhurst Starbucks location, barista Chuck Stankey told reporters Tuesday that the adoration and gratitude he’s received from customers has made the last five days the most exciting time of his life and has him feeling “like a rock star”. Since its grand opening on Friday, the highly-anticipated York Street and Industrial Drive location has been immensely popular, with as many as 40 cars lined up daily at the drive-thru window before the coffee house opens at 5:00 a.m. Peak morning hours have seen vehicle lines extending out of the parking lot, creating bumper-to-bumper traffic both northbound and southbound on York Street, with the northbound line reportedly stretching as far as halfway up the York Street exit ramp from westbound I290. 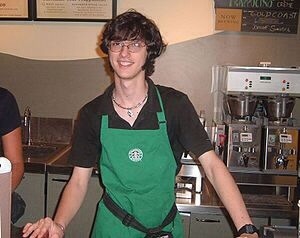 The only negative of his job thus far has been educating the locals on unfamiliar Starbucks product names, ordering protocol and lingo.